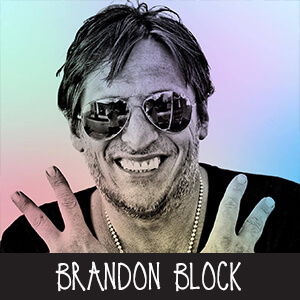 You would have to travel far and wide to find a place where the name Brandon Block is not well known. Brandon has carried a legendary status tag ever since being one the first residents on the Space terrace, Ibiza. His residency, was arguably one of the initial driving forces behind the club worldwide notoriety as one of the best places to party. Along with the success came a prolific drug addiction that almost caused the end to Brandon. But, in 1996 since entered the Charter Nightgale Clinic In Lisson Grove, for a three week detox and he has never looked back. Achieving all of his greatest personal and professional success after bettering the habits his name become synonymous for. In 2010 he felt the urge to help people with his knowledge of how the mind works and Thought Coaching. Brandon’s infamy, once put to good use, was a big contributing factor in his ability to empathise and help people. The next 7 years saw Brandon move from working alongside the criminal justice system, to helping with Mental ill-Health, Drug and Alcohol addiction and people who have Multiple Complex Needs. Brandon’s expertise in helping people identify the emotional triggers, ensuing though process and call to action, then providing the correct tools to transform the thought, emotional state and creating power to make better choices, saw him become a SMART recovery trainer’s trainer and help hundreds of people to a better way of being. Brandon’s personal experience, insight and work within the local authorities, at the most complex levels of mental health, allowed him to identify a gap in the treatment system. So, he set about creating a well-being app called ‘Get Well Together’ and took a new journey of personal development, to upskill himself to become a powerful Thought Coach. After qualifying as a Goal Mapping Practitioner, Brandon co-founded Happy Days to deliver tailored holistic wellbeing experiences. Happy Days started as a Facebook project, quickly becoming incredibly popular and expanding to a life changing coaching business, Tent Talks at major festivals, an Online Coaching Subscription, App, Community Outreach Projects and a Conscious Clubbing Brand. Brandon’s unique humor, personality and wealth of experience, have been invaluable to the lives that he’s touched and guided to spectacular transformations, gaining acknowledgement and acclaim from the media and most importantly, the testimonials of the amazing people he’s worked with.